The world of the Lego is seriously all the rage now. There was a moment of radio silence for a while there. As a kid, I loved Legos and having the ability to create something from nothing, but then of course, I grew up. There were always new sets, but they didn’t really make waves from what I can remember, until the Lego video games based off of epic movies started coming out. Suddenly, everything Lego is awesome! Video game after video game came out, and then there were the movies, but even the movies were completely CGI like the games. One problem, our minds don’t create CGI, we know what’s real and what’s not. 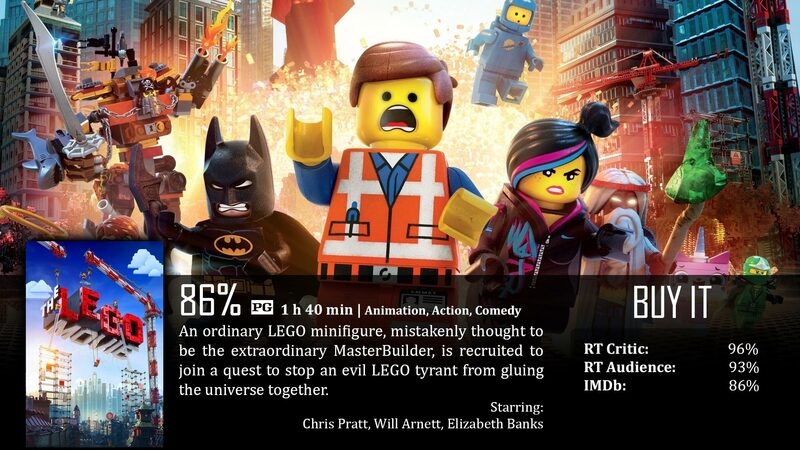 The Lego Movie did something incredible, it transported adults and kids alike into a world of imagination. Something I personally haven’t seen in a while. The Lego Movie is a stop-action film with a bit of CGI for flavor – about a generic Lego man named Emmet Brickowski (Chris Pratt) that lives in a very repetitive and brainwashed city of boring, procedural rules, controlled by President Business, aka the evil Lord Business. Lord Business wants things to stay the same in his city so badly that he is planning to unleash the Kragle (Krazy Glue), freezing everyone in place…forever. To save the day, Emmet is chosen to be the leader of the resistance – a bunch of independent master builders including Vitruvius, a blind but prophetic wizard; Wildstyle, a chick with an attitude and ironclad devotion to the cause…and Batman. Together, they must learn the best of both worlds to save the day. There are so many crazy good things to say about this film that I don’t know where to even start, nor do I think I’ll be able to fit everything in because I continue thinking of good things. This takes you back to your childhood, it really does. CGI is getting really good, but there’s always a part of our brain that continues to distinguish between the two, and the use of stop action was brilliant. It’s about the scale. The film opens on a really small Lego house where Emmet lives, and you can totally remember placing your Lego guy in a small room and calling it a house. He is also a generic Lego, the typical kind you found in your basic Lego sets…just with hair. The movement is very stop-action like, but it’s also what you imagine when you play with Lego toys. When you play with them, you don’t see yourself…you don’t even hear yourself. You hear a multitude of different voices, and these toys live in a completely different world. A lot of a child’s imagination is so clearly seen here that you can almost see a kid playing with these toys as if you’re seeing through his mind eye. Honestly, it’s very well made for so many different reasons. The animation is perfect for this type of film, it’s beautiful. Not only that, but the pacing is practically genius. First you have the one guy in the small room, the bigger city, introduced to an expanding universe of the amazing and unknown, and then to familiar characters, all moving towards the collective plot to stop the bad guy. So it looks amazing, the pacing is spot on, the plot is solid, and the messages are really great. This is an underdog story at its core You got the little guy, picked on by virtually everyone he’s ever known, and everything points to the fact that he isn’t special, but he’s the one that is supposed to save the day. Then the film goes on to teach you that being different is good, having foreign ideas are welcome, that following rules is good, but being independent and thinking for yourself is just as important…that they work hand in hand. All of this wrapped inside jokes that really work for all ages. Kids will love this film because it is colorful, it’s got funny characters with funny voices performing physical humor, and it’s all to stop the bad guy. Though it doesn’t stop there. There is a lot of self-aware and inside joke humor for plenty of adults to enjoy. Kids might not catch those jokes because they’ll be distracted by something else that’s equally as hilarious in their perspective. This is the perfect family film, it really is. In short, The Lego Movie is a wonderful film that is imaginative and nostalgic, filled with a lot of great humor, animation, characters, story, and morals. It brings you back to the good old days of what imagination is all about among a story that is just really fun to watch. Not much honestly. What it comes down to is that I don’t think I’ll personally buy it. I’ll watch it a few more times, sure, and I know plenty of families that would benefit off of buying it. It’s a great film, just not something I would personally buy. It’s actually my 26th birthday today, and this is the film I decided to watch this year. Not a bad choice. Emmet: Introducing, the double decker couch so everyone could watch TV together and be buddies. Haha great birthday treat man! And great perspective on the expanding scale, I hadn’t actually examined that part of the movie, but you’re completely right. It does expand rapidly and consistently, getting more and more epic by each passing act. Simply a marvelous film. Glad you liked. Yeah, this movie’s a bunch of fun and definitely the best movie of 2014 so far. I guess that isn’t saying much, but still, it’s a great movie to watch nonetheless. Good review Dave. Awesome review of an awesome movie! One of the best animations we’ve seen in years. So much fun.